Does the black vulture stand a chance of becoming the official bird of Maine? Through the process of elimination, it just might, say scientists who released a report about climate change affecting migratory birds Monday. 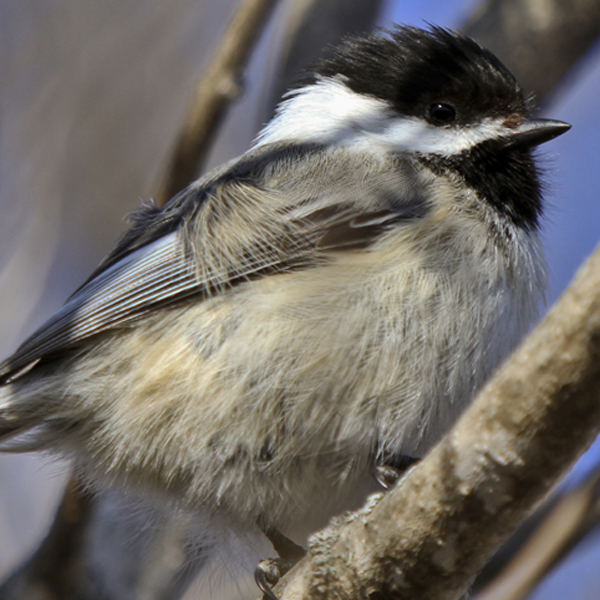 The black-capped chickadee, which has been the official bird of Maine since 1927, has a more northerly habitat than the larger vulture, which has a traditional range that extends from the mid-Atlantic states all the way through South America. Over the past decade global air and water temperatures have increased significantly, shifting the black-capped chickadee’s and black vulture’s range northward. The black vulture can now can be found in southern New England, scientists said Monday during a teleconference about a new National Wildlife Federation report on bird’s changing habitats. There are indications that the chickadee’s habitat in Maine is shifting away from the coast and toward the Canadian border, they said, while the black vulture moves further into New England from the south. “There are a whole bunch of species like that,” Hector Galbraith, northeast scientist for NWF, said Monday about the vulture. The red-bellied woodpecker is another example of a more southerly bird slowly moving toward Maine, he said. Around 1990, there was one known nesting pair in New England, in Cape Ann, Mass. Now, he added, there are hundreds if not thousands. The puffin, Bicknell’s Thrush and the saltmarsh sparrow are examples of birds now found in Maine that face challenges due to climate change. 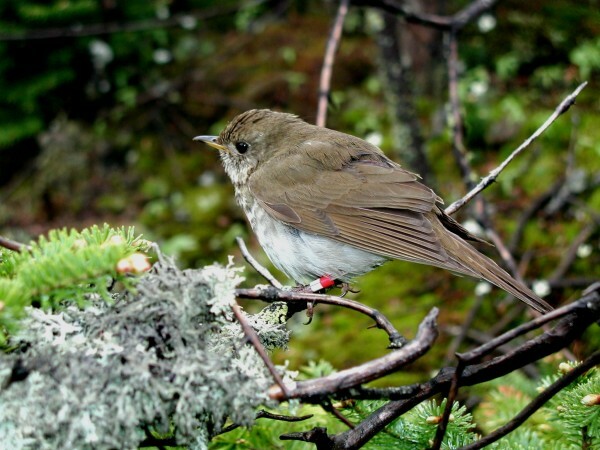 In the case of Bicknell’s Thrush and the saltmarsh sparrow, warming temperatures and rising ocean levels are reducing the amount of alpine and coastal marsh habitats they prefer. Puffins, which are found from Maine and northern France to the Arctic, seem to be contending with a lack of small fish, which they depend on for food. There also have been reports of terns in Maine being affected by a combination of food and weather pressures. Birds that depend on plants or insects for sustenance along their migration routes might be the most vulnerable to the effects of climate change. Rich MacDonald, a Bar Harbor naturalist and board member of Downeast Audubon who did not participate in Monday’s teleconference, said migratory birds often rely on changes in daylight hours when they time their migrations, but plants and insects respond more to temperature. Consequently, as winters become more mild, plants might sprout and bloom and attract insects before the birds that eat them arrive, MacDonald said. Birds that are better at adapting from one food source to another won’t be affected as much as birds that are diet-specific. 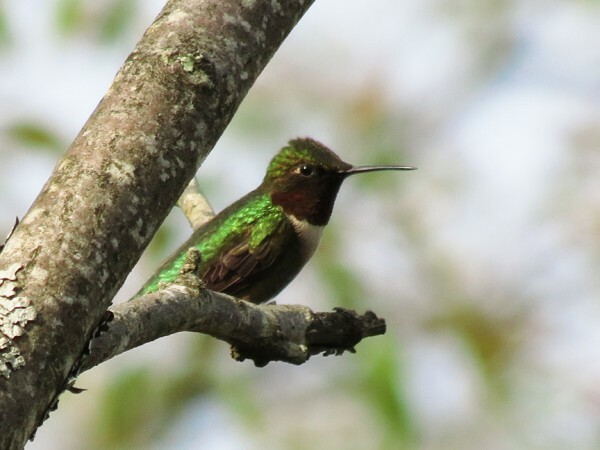 For example, the ruby-throated hummingbird, which now migrates north each spring several weeks earlier than it used to, may be reacting to a shift in the availability of food along its migratory routes, he said. “Birds that are specialists in what they eat are having trouble finding food,” he said. Turkey vultures, cardinals and house finches, all of which have broad appetites and are well adapted to the presence of humans, are among other species that seem to be following milder winters into Maine, he said. Other factors beside changes in temperature patterns play a role, MacDonald added. Human changes to habitat, both in population growth and physical changes to the landscape such as waterfront development, have had significant direct effects on birds and are believed to be contributing to overall climate change, he said. Increased food competition has, too. 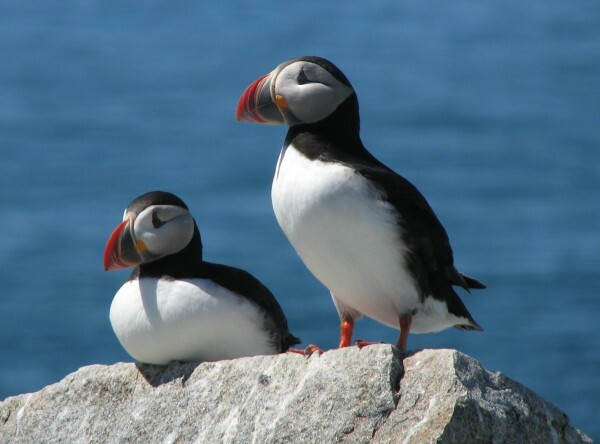 The lack of fish that sustain puffins may stem from climate change, but increased fishing pressure on smaller fish species, MacDonald said, could be a greater factor. For the red knot, a migratory bird that depends on spawning horseshoe crabs in Delaware Bay for food during its journey north toward Maine and beyond, commercial horseshoe crab fishing has reduced the number of horseshoe crabs and therefore been a major factor in the birds’ declining numbers, MacDonald said. Scientists in Monday’s teleconference said that, at some point, overall rise in global temperature likely will result in even more significant changes. Galbraith echoed Wells’ concerns about how climate change might manifest if temperatures continue to climb. “If we don’t get our act together, we’re going to see major changes in the future that will make the changes we have seen pretty penny ante,” said Galbraith referring to a poker term for having little value. NWF and Natural Resources Council of Maine said federal limits must be set on carbon pollution, more of the nation’s energy supply should come from “clean” technologies such as wind and solar rather than from fossil fuels, and more protections should be put in place for sensitive habitat and undeveloped lands such as forests and farms. “We need urgent action at the local, state and federal levels to cut carbon pollution and confront the changes we’re already seeing,” Larry Schweiger, president and CEO of NWF, said in a prepared statement. Scientists participating in Monday’s teleconference said the issue of climate change has gotten bogged down in politics even though scientific studies overwhelmingly indicate that global average temperatures are on the rise. Specious arguments that climate change isn’t occurring are being made and publicized for monetary reasons, they said. The news media has aggravated the political debate by giving the deniers equal weight in coverage of the issue, even though there’s virtually no debate about it in the scientific community, they added. Correction: An earlier version of this story incorrectly referred to the Natural Resources Council of Maine as Environment Maine.